MBA Villa reminds me of Greece or Italy, with the lush foliage and in-your-face coastline view. Since it’s on a steep cliff, I wouldn’t recommend this villa to families with small children. MBA Villa is located on a steep cliff at the end of Pointe Milou’s peninsula neighborhood. It is also close to Marigot Beach, Columbier Beach Trai, and Lorient Beach. 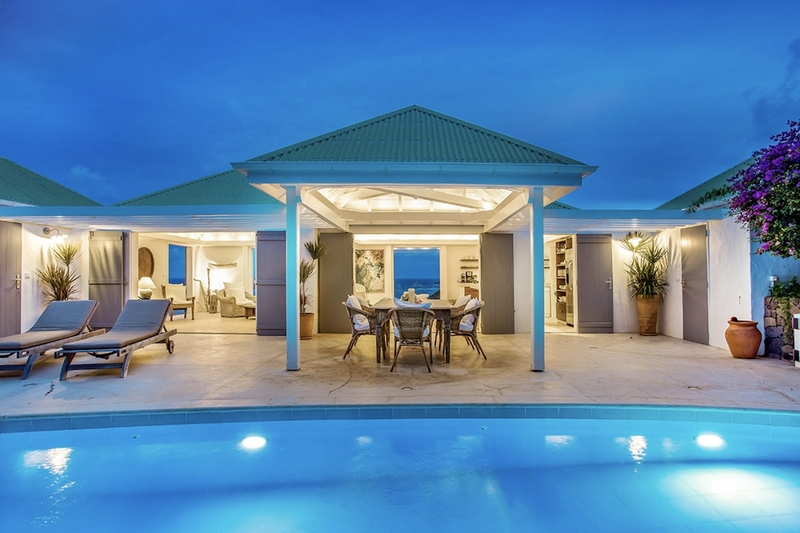 The pool deck is expansive, with a private lounging area over the coast on one side of the villa and the pool, lounge chairs, and outdoor dining on the other. A path leads down to the rocky coastline, giving you your own glimpse of the ocean. MBA Villa’s rooms are bright and airy. The living area opens to the terrace’s outdoor sitting and dining area, as well as the kitchen. The fully equipped kitchen features modern appliances, a large island, and access to the outdoor and indoor living spaces. An expansive glass window just to the side looks out over Pointe Milou bay. The master bedroom has access to both outdoor areas, as well as a queen bed, ensuite bath, and ocean view. The second bedroom has two twin beds that can be converted into a king prior to arrival, as well as an ensuite bath and ocean view. MBA Villa may be rented in combination with the nearby Villa Little Caramba for a total of three bedrooms.